1) Their ability to look into the past and learn from it. Now, I hear complaints at times that ArenaNet doesn’t learn from their mistakes and have no hope or future. This is pure lunacy. Sure, there can be validity to some people wrestling through lore conflicts and issues (which is bound to happen to some extent in any sequel, especially when one wasn’t originally planned from the beginning), but the assertion that ArenaNet doesn’t care about what they hear is ridiculous. They hear, they read, and they work for a purpose. Of course, in their attempt to develop something that is simultaneously art, entertainment, and business, there are bound to be awkward lines to try to wrestle through. As we’re seeing in Living Story Season 2, they’re looking back at what they did right and what they could improve on from last year. They’ve heard the cries of wanting more solo content (repeating story instances with achievements linked to them) and even created a new zone! They’re now trying to find a “sweet spot” in terms of where everything is focused on the story development by avoiding opening up Dry Top too much at once so that it becomes stale, while still keeping an emphasis on it. This takes time, effort, and meticulous planning based upon what they’ve learned from Season 1. So far, I’m blown away. You guys are doing awesome! 2) Their strength and determination for their dreams and goals, and sticking to it. This is probably one of the greatest things I admire about ArenaNet. Yes, many people think that because they’ve paid for the game that Guild Wars 2 should be exactly what they want, how they want, in the way and time that they want. I’m afraid I have to disagree on the basis of leadership. Good leadership doesn’t mean you bend over backwards every time someone comes with a complaint. Yes, it means that you listen adequately, but you don’t have to do everything they say. Contrary to popular belief, the customer is not always right (and from my experience, seldom right if they’ve never had the experience of being in the business). Yet ArenaNet does not run around and bash people who complain. They merely listen and disregard unproductive chatter and focus on things that are productive. Still, at the end of the day, they have their dreams and goals and are going to follow them. They have a vision and a plan and yes, we are being heard–it does not mean that it’s going to be exactly what we want or expect. Is it frustrating to hear that things will be ready “soon”? Yes. Those lines need to be used less frequently. Instead, they’ve been focusing on the forums lately to be less chatty about things being done “soon” and more on “we can’t talk right now about it because it will spoil things, and may change.” Whatever they say about the game in the public eye will be taken as gospel truth. On one hand, we need to take it all with a grain of salt until it’s been implemented in the game. On the other hand, they should always be careful as well. Still, I have tremendous respect for ArenaNet and where they’re going. I was disheartened for a while, but look back and wish I had committed myself earlier to the Living Story. Now, I’m on board. I’m sold. SPOILER ALERT: If you have not completed Living Story Season 2: Episode 2, “Entanglement,” then there will be spoilers in the following. It didn’t take me long to fall in love with the next bit of our Living Story. Already today we’ve seen a snapshot of what’s coming next and I’m pretty excited. Mordremoth’s reach is spreading across Tyria. We’ve seen vine after vine, absorbing magic through the waypoints, which can only mean that Mordremoth is gaining strength at an alarming rate. This is going to create a bigger foe than we’ve ever thought possible! It’s in ArenaNet’s hands now to escalate this to a level we never imagined, and I think they’re going there! 1. The hero suddenly knows Mordremoth’s name, without any explanation. I can’t really find a solid explanation of this, and I wish this is something they hadn’t done. I’m usually pretty gracious, but this one made me do a double-take. 2. We intercept Taimi from using Omadd’s machine and end up seeing the vision ourselves. My wife’s exact words were: “Mass Effect, much?” It honestly didn’t bother us, but we laughed. Still, there are enough significant differences, if only in the vision itself, that make it completely unique comparatively. 3. Apparently, a moose has seen the Eternal Alchemy in Omadd’s device as well. Still, despite these couple things (and a hilarious #3), I feel that good ol’ Mordy is a pretty fun villain. We’re seeing things of Scarlet tie together like how the Steam creatures were developed and how the portals work; we’re experiencing brand new monsters that we’ve never faced (always a favourite experience of mine); we’ve seen that there’s something greater going on in Tyria involving the Elder Dragons than we ever imagined. People are speculating as to what each of these orbs mean that we saw in Omadd’s device (which, by the way, I did not expect in the slightest!). Personally, I think something’s pulling the strings on the Elder Dragons to maintain a balance of magic within Tyria. 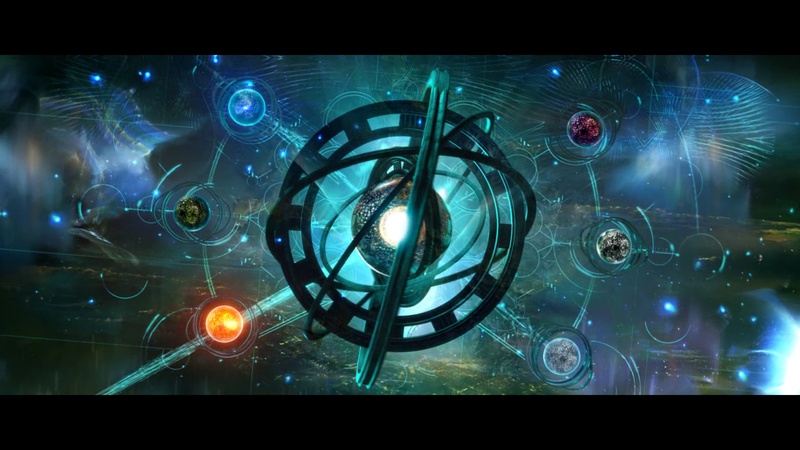 We see orbs representing Kralkatorrik (top-right), Zhaitan (right), Jormag or Bubbles (bottom-right and top-left), Primordus (bottom-left), and finally Mordremoth (left). Still, Mordremoth gets pulled into the center and things go a little bit crazy… what does it all mean? I’m sure we’ll know in 2015, but for now I think we’re on a good path. Permanent stories that remind me of GW1 missions, new skins (such as the ambrite weapons), and a new permanent area. We’re moving forward in a way that is both functional and aesthetically pleasing, and that makes me happy. Will this progress keep up? I certainly hope so. They’ve already started finding a bit of a sweet spot in terms of the releases, at least for me, and I hope they keep up with the surprises. The continued elaboration on Scarlet is extremely welcome, and Taimi is a breath of fresh air. 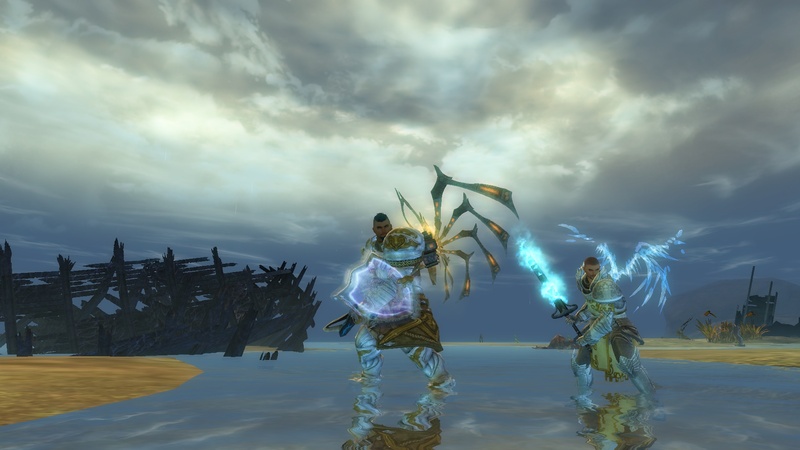 Jory and Kasmeer, I could do without, but hey, we’re improving with every step! My apologies for the lack of updates lately. I’ve been travelling a lot and had limited access to the internet. In hindsight, I should have scheduled some posts for you lovely people to indulge in! Long time no see, fellow Travellers! Has Dry Top drawn you into where we’re going? Today they’ve dropped the next segment of Living Story: Season 2 and I know we’re all itching to see what Mordremoth has in store for us, but there’s definitely a few adjustments I’m having to make. Maybe it’s because I’m not a guy who cares how many achievement points I have, but I find that the rewards aren’t as compelling so far as Season 1 was. Of course, I only have one episode, and the second episode just dropped today. Sure, there are random items through the chests crafting, and other means, but I actually enjoyed meta achievements. |At least, so long as they felt pretty balanced (and didn’t require incessant grinding). Who’s to say that we won’t have the season segmented into groups of episodes, with a meta achievement for getting all the achievements in that section? That would definitely be an interesting approach. Since it’s permanent, you would have all the time in the world. I don’t think it’s fair for me to expect content that will take up all of my GW2 time when it’s based on releasing every two weeks. There’s a lot of hard work that goes into it, and I’m excited to take my time and enjoy it as best I can. There’s progressively more permanent content that we can revisit, and we’re slowly watching bits and pieces of the world change already (no spoilers, but try checking Fort Salma in Kessex Hills). While last season it took a long time for things to change, it’s happening quickly this season. Given that things are actually progressing and physically changing in Tyria, I need to remind myself that there is lots of content available, and I have no right to complain that there’s nothing to do if I haven’t tried to enjoy it myself in the first place–a pill I need to be sure to swallow from time to time. It’s not because I shouldn’t expect great things from what ArenaNet’s doing, but I think we hype ourselves up in our heads over what we think the game ought to be (and often times, I think it’s unrealistic compared to what any human being is capable of doing). I find this attitude will keep me more pleasant and excited for what’s to come. So this is one of my “I’m getting pretty serious” blogs, but I think this is important. I know a few people both in-game and in real life that can only focus on the negative things. Instead, offering constructive criticism can be very useful (and has been stated multiple times that it’s exactly what ArenaNet are looking for on the forums). It’s more than ok to express what you like or don’t like about the game, but when that’s the only thing you talk about (or you aren’t able to offer a way it should be improved), then it’s just a complaint. This isn’t useful for anyone, and this is a trap I can find myself in very easily as I’m often a cynical person by nature. ArenaNet, I feel like I should say “I’m sorry” about my impatience sometimes. I don’t really post negativity on forums or anything, and I avoid being negative with people (because it comes too naturally for me), but I’ve found myself irritated that things aren’t improved “immediately.” Yet ArenaNet still needs time to look at metrics, feedback from their content, as well as to sift through what works for them and doesn’t, and find a middle-ground with where they should go. They can’t put out one patch and say: “Ok, these three things should have been done different” and change the next release’s content in less than two weeks. 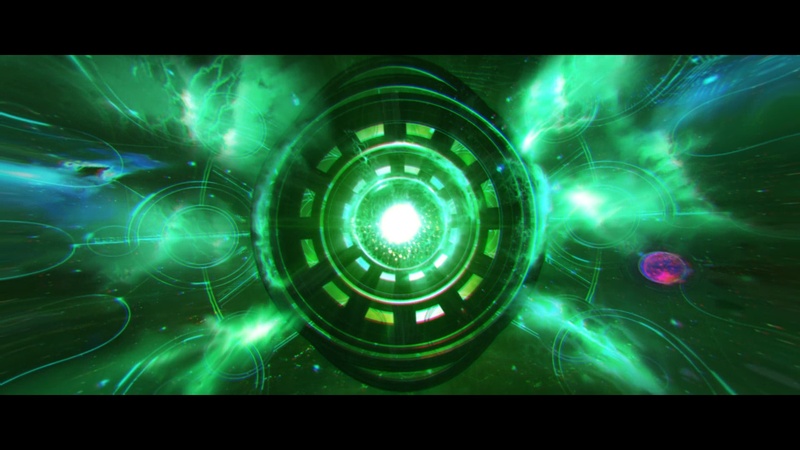 The great thing about this, is that I believe with the knowledge that ArenaNet has from LS1, LS2 is going to be amazing. I can’t wait to play it tonight! Is there anything you find yourself having to work through when it comes to being patient with MMO developers? Anything you’ve learned that you could add? Please post your comments below! Mahd has great taste in armour!